Ryan Cross is no stranger to the mountains. He’s explored the backcountry in Europe, made tracks on the West Coast Trail, climbed the Sea to Sky corridor, and traversed both the Rockies and the North Shore mountains. 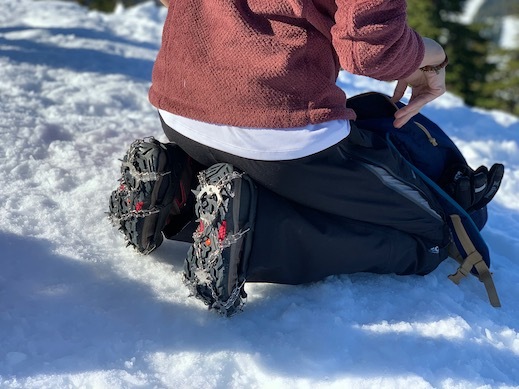 So when Cross and his brother set out to hike a new trail on Grouse Mountain on the morning of June 22, 2014 — an area they’ve been to hundreds of times — the last thing he expected was to be returning by helicopter with a broken arm. Cross spent the afternoon dangling from a helicopter flown by North Shore Rescue, one of 80 volunteer-run search-and-rescue teams that operate across the province. The helicopter carrying his rescuers was funded through Emergency Management BC, a government agency that co-ordinates rescue services. But the harness he rode in did not have guaranteed provincial funding, nor did the helicopter time SAR members used for training. And with Cross being just one call out of around 1,700 that search-and-rescue groups across the province receive every year, many to save lost hikers or people caught in avalanches, the need for funding this equipment and training is always a concern — especially as the number of search-and-rescue incidents increases. And after a month of financial uncertainty following no mention of any new dollars for search and rescue in the February B.C. budget, the province addressed this need with an injection of $18.6 million Saturday, the largest single amount in history. “These funds will fill an immediate need so that B.C.’s search-and-rescue crews can continue the important work they do,” said Public Safety Minister Mike Farnworth. While SAR team members expressed relief over the announcement, concerns still remain as many are still waiting for a long-term solution. Farnworth also announced the province is working towards a sustainable funding model for search and rescue in B.C. over the next three years — a project the BC Search and Rescue Association has been advocating for since 2013. Crampons like these are not guaranteed by provincial funds. Every year, SAR teams across B.C. apply for a government grant for expenses not guaranteed by Emergency Management BC. Training and equipment fall into that category. The amount they receive, however, is unpredictable. Along with training and equipment, the association plans on allocating the funds to prevention programs and programs that provide psychological first aid for SAR volunteers as their call numbers rise. 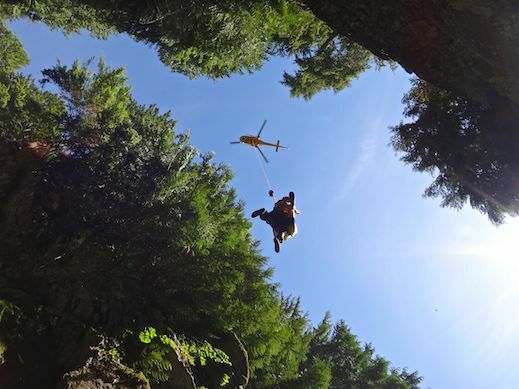 Search-and-rescue teams in B.C. received around 400 calls per year in 1990, and now they average more than 1,700 per year — a 325-per-cent increase. 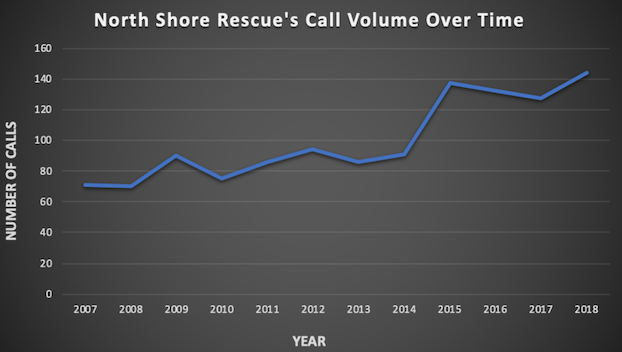 North Shore Rescue broke its number of calls in 2018, totaling 144 for the year. Mike Danks, team captain of North Shore Rescue, said his team sees a lot of people coming to the North Shore Mountains from the city — many unprepared. 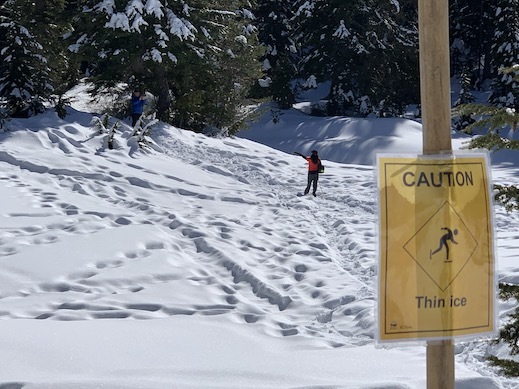 A woman being photographed standing atop a frozen Yew Lake, despite the cautionary “thin ice” sign. As people act more precariously for the shot, rescues have become more complex in recent years, he said, adding further strain to search-and-rescue funds. Emphasizing prevention as a way to avoid needing a severe rescue, Mushumanski said the best way to be prepared is to be informed. And Cross did many of those things before his fateful hike on Grouse Mountain. His phone was charged, he had maps, and he wasn’t hiking alone. Simple things that could end up saving a life — just as they did his. WATCH: How prepared are hikers for Cypress Mountain?